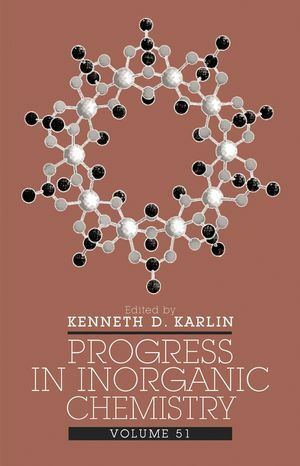 Progress in Inorganic Chemistry continues in its tradition of being the most respected forum for exchanging innovative research. This series provides inorganic chemists and materials scientists with a community where critical, authoritative evaluations of advances in every area of the discipline are exchanged. With contributions from internationally renowned chemists, this latest volume offers an in-depth, far-ranging examination of the changing face of the field, providing a tantalizing glimpse of the emerging state of the science. KENNETH D. KARLIN is Ira Remsen Professor of Chemistry at Johns Hopkins University. He received his PhD from Columbia University. Chapter 1: Fundamental Coordination Chemistry, Environmental Chemistry, and Biochemistry of Lead(II) (Elizabeth S. Claudio, Hilary Arnold Goldwin, and John S. Magyar). Chapter 2: Chromium in Biology: Toxicology and Nutritional Aspects (Aviva Levina, Rachel Codd, Carolyn T. Dillon, and Peter A. Lay). Chapter 3: Laterally Nonsymmetric Aza-Cryptands (Parimal K. Bharadwaj). Chapter 4: Coordination Complexes in Sol-Gel Silica Materials (Stephen P. Watton, Colleen M. Taylor, Grant M. Kloster, and Stephanie C. Bowman). Chapter 5: Crystal Chemistry of Organically Templated Vanadium Phosphates and Organophosphonates (Robert C. Finn, Robert C. Haushalter, and Jon Zubieta).